We’d love your help. Let us know what’s wrong with this preview of Le chiavi del pensiero positivo by Napoleon Hill. L'autore, ideatore dell'Atteggiamento Mentale Positivo, presenta in questo volume i principi e le tecniche necessari per concentrarsi sugli obiettivi da raggiungere, superare la paura di non riuscire, massimizzare le proprie doti personali. To ask other readers questions about Le chiavi del pensiero positivo, please sign up. Every people want to success, achieve their dream. A quote from this book that make me realize what the first step I have to do "A Dream without a Plan is only a WISH". Folks, we all have dreams, goal we want to achieve as soon as possible. But again, do we have a plan to achieve, or we just sit and imagine all that dreams? Read this book and you will find a path to achieve all your dream. This review has been hidden because it contains spoilers. To view it, click here. I enjoyed this book. It opened my eyes to a few new concepts. I have read a ton of self-help books so nothing in the book was really that new but I think I will benefit from it. I think I will read the real book by Napoleon Hill now. I will use some of the suggestions he makes like Prayer, Mediatation etc. I am trying to enhance my PMA efficiently and for that this book is valuable. I think my favorite quote from it is at the end, from James Mackintosh, "It is right to be contented with what we have, never with what we are." Always be grateful for the blessing and gifts we have been given, but also always strive to be better. Great reminder of what, how and why to put a positive twist on everything we allow into our minds. Great tips, valid points, useful truths. Easy to read too. I will have to read this book a few times. I love the advise given and think it has already made me a more confident person. Interessante, giudizioso e consigliere. Ne avevo bisogno. 1. Take possession of your own mind with conviction. 2. Keep your mind on the things you want and off the things you don’t want. 4. Eliminate all negative thoughts by self-inspection. 5. Be happy, make others happy. 6. Form a habit of tolerance. 7. Give yourself positive suggestions. 8. Use your power of prayer. 10. Study, think and plan daily. Un libro 'classico' sul pensiero positivo, che ne sottolinea gli assiomi. 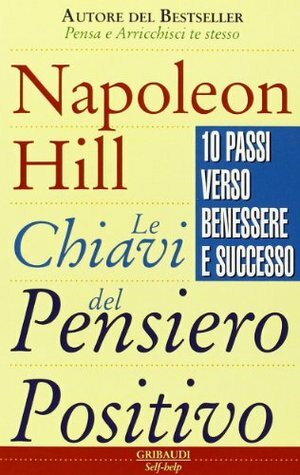 Seguendo i 10 passi indicati da Napoleon Hill, si può migliorare la propria vita e il proprio rapporto con gli altri. Ogni capitolo termina, oltre che con alcuni test da autosomministrarsi, con citazioni celebri sugli argomenti trattati. The book that can change your perspective. This is an amazing book. I would recommend this book my class. Trong quyển sách này tôi tìm thấy những tư tưởng xây dựng bấy lâu.. Nhưng nó nhắc tôi rằng ngoài nghĩ dc thi cần phải vận dụng vào cs như là hơi thở vậy..
"Hãy làm cho người khác điều bạn muốn họ làm cho bạn"
"Khi gặp một người thiếu vắng nụ cười hãy trao cho họ nụ cười của bạn"..
something happens because it has to, no reason or "Logic behind" , this sentence is literally and metaphorically wrong. scientifically speaking human brain turns words into visual image, so you can reinventing the visual experience of tough situation by reforming the visual image in your subconscious, I know that what's done is done, you can't change the past but you can affect the present then the past. seek and ya shall find.